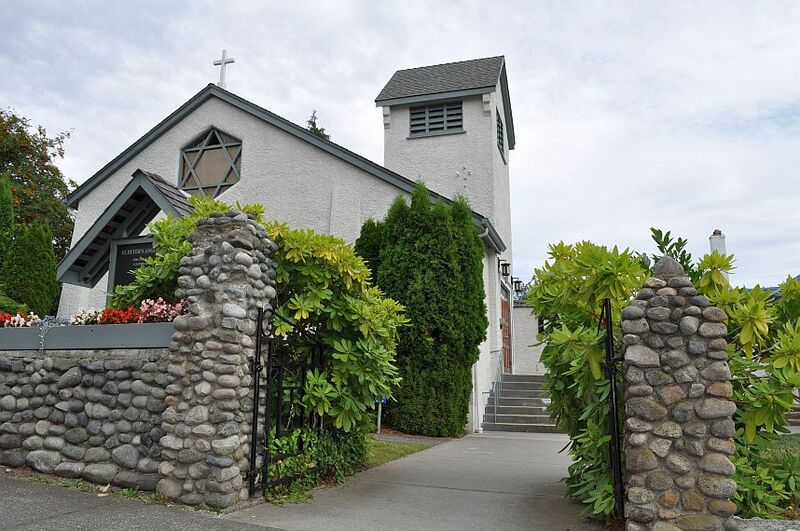 Within its region, the Town of Comox on Vancouver Island is equivalent to New Westminster in Metro Vancouver or Oak Bay in Greater Victoria. 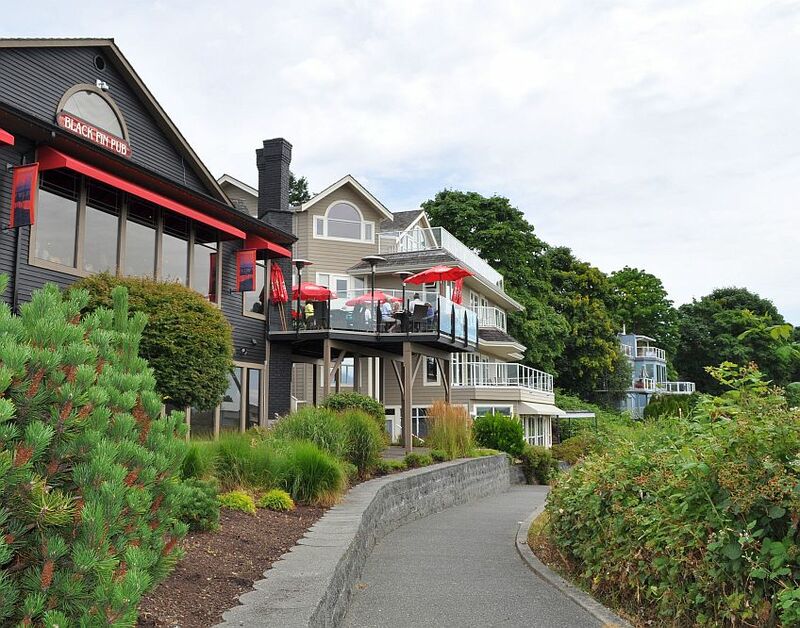 Comox is hemmed in by a bigger urban neighbour (Courtenay) and prevented from sprawling; it is forced to focus on how to densify its neighbourhoods, especially its downtown, building on its history and waterfront location, and boosted by regular non-stop commercial flights between Comox Airport and Calgary, Canada’s oil and gas capital. British Columbia is unusual in Canada in maintaining multiple local governments in some urban regions (there are 21 in Metro Vancouver, or 22, depending on how you count). There are occasional calls for the amalgamation of municipalities, with the idea that this would save money. I don’t believe it would save money; further, the municipalities with limited land areas seem to do better (on average, with flaws) at building walkable communities. 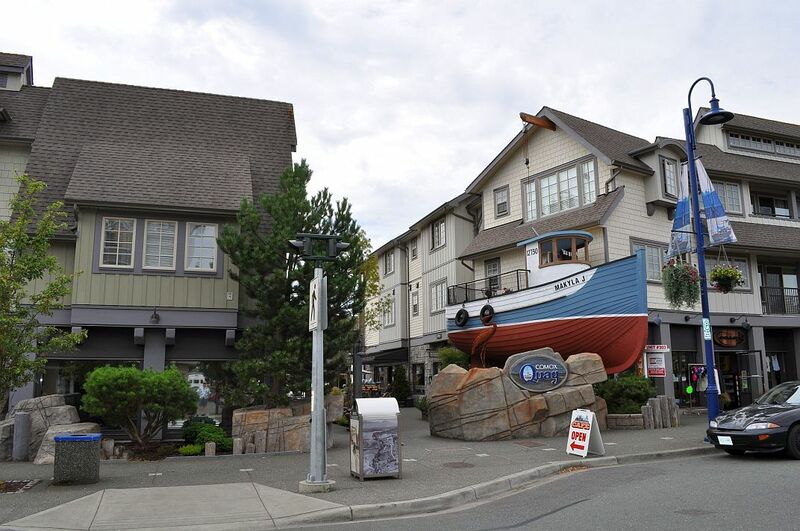 Courtenay’s urban village has great potential, but on the surface the city’s plan looks weak in terms of integrating residential and commercial uses. 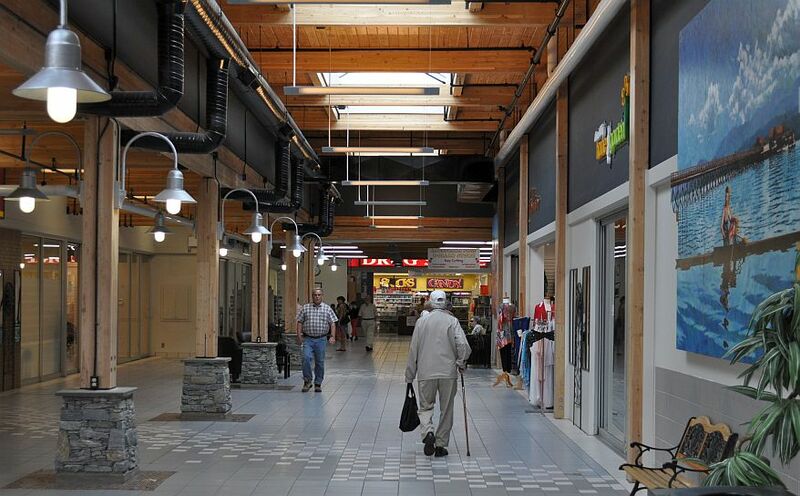 Campbell River, the next city to the north of the Comox Valley region, has emphasized big mall and strip-mall development. 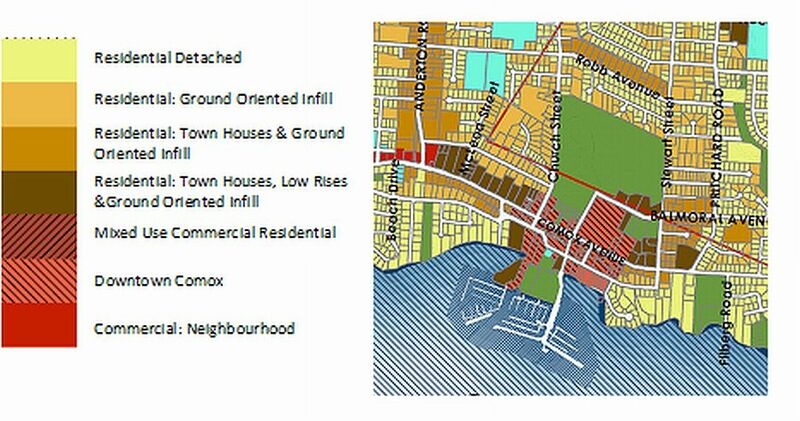 Comox has built a vision for a true village into its Official Community Plan, with a defined medium-density residential perimeter of 500 meters around commercial and public services. This is driven partly by the town’s status as a retirement capital; and in this case, the high number of resident seniors is supplemented by the affluent boaters who dock at the marina just south of Comox Avenue. The regional hospital just west of the village has been a bonus for seniors; however, the hospital is to be moved to a new location on an arterial road in Courtenay by 2017. Settlement in Comox dates from the 1860s, but little heritage architecture remains. The Lorne pub and hotel, which was B.C.’s oldest inn, burned to the ground in early 2011. 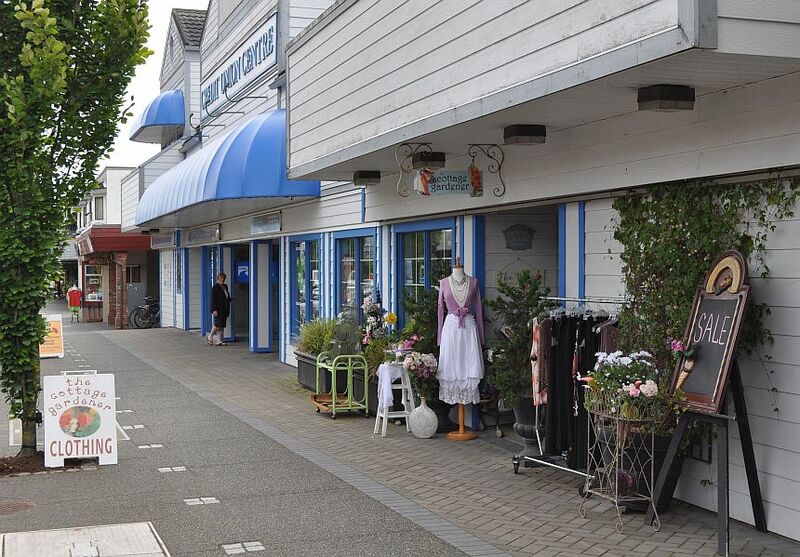 The dominant layer of commercial architecture mixes the one- and two-story styles that are common across B.C. ; the planners are now overlaying this with a “marine theme” that produces sometimes tasteful and sometimes gaudy results . About 1980, the Town approved the construction of an automobile-oriented shopping mall close to the high street. The supermarket, drug store and liquor store were busy enough on the day we visited, but half a dozen retail spaces on the short main corridor were vacant. My co-tourist for the day was Thomas Walker, who lives in rural Courtenay and enjoys trips into Comox Village. We ate at the Toscanos Trattoria overlooking the marina. Tom says there is an excellent choice of good restaurants in the village — partly because of the wide variety of good food produced in the Comox Valley, including fruits, vegetables, meats, cheeses and wines. Seifert’s Farm Market along the airport road makes an excellent side trip.